Yam Brands is putting a whole new spin on Asian cuisine. Our concepts combines taste with speed. 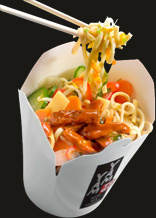 Each dish is prepared with quality ingredients offering an authentic Asian flavour and served in attractive “food cartons”. Customers simply choose from a selection of oriental main dishes accompanied by a choice of rice or noodles: their choice is then heated on-site and they're good 'To Go'! But unlike the typical local takeaway there is no deep fat frying which means our Yam concepts are not only tastier but healthier as well.